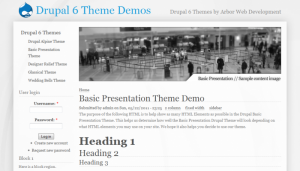 The Basic Presentation CSS template has been ported into a theme for Drupal. The first release is made for Drupal 6.x, but a Drupal 7 version will follow. The theme demo reminded me that the position for the background image in the original template is set to ‘fixed’, which is not very good for pages with a lot of content. In order to improve the visual impression of the design, I will update the template tomorrow to replace the fixed background with one that follows along with the content no matter how long the page is. Drupal theme developer Jason “sk33lz” Moore (who made the Basic Presentation theme) has promised to update the theme with the new background position, so I will wait with adding the theme to the Drupal themes page until the template and theme have both been updated. Until then, you can get it from the official Drupal theme directory. I first heared about You on the swedish radio. It was a good program! I got hooked from your work man!